Alan Blinder has a distinguished resume. He’s a professor at Princeton and he served as Vice Chairman of the Federal Reserve. So I was interested to see he authored an attack on the flat tax – and I was happy after I read his column. Why? Well, because his arguments are rather weak. So anemic that it makes me think there’s actually a chance to get rid of America’s corrupt internal revenue code. There are two glaring flaws in his argument. First, he demonstrates a complete lack of familiarity with the flat tax and seemingly assumes that tax reform simply means imposing one rate on the current system. Here’s some of what he wrote in a Wall Street Journal column. Many useful steps could be taken to simplify the personal income tax. But, contrary to much misleading rhetoric, flattening the rate structure isn’t one of them. The truth is that 100% of the complexity inheres in the definition of taxable income, which takes up millions of words in the tax laws. None inheres in the progressive rate structure. If you don’t believe that, consider the fact that the corporate income tax is virtually flat once a corporation passes a paltry $75,000 in taxable income. Is it simple? Back to the personal tax. Figuring out your taxable income can be quite an effort. But once that is done, most taxpayers just look up their tax bill on an IRS-provided table. Those with incomes above $100,000 must perform a simple calculation that involves multiplying two numbers together and adding a third. A flat tax with an exemption would require precisely the same sort of calculation. The net reduction in complexity? Zero. I can understand how an average person might think the flat tax is nothing more than applying a single tax rate to the current system, but any public finance economist must know that the plan devised by Professors Hall and Rabushka completely rips up the current tax system and implements a new system based on one tax rate with no double taxation and no loopholes. Heck, the Hall/Rabushka book is online and free of charge. But Blinder obviously could not be bothered to understand the proposal before launching his attack. What about his second mistake? This one’s a doozy. He actually assumes that taxable income is fixed, which is a remarkable error for anyone who supposedly understands economics. …flattening the rate structure won’t make the tax code any simpler. It would, however, make the tax system far less progressive. Do the math. …Someone with $20 million in taxable income pays nearly $7 million in taxes under the current rate structure, with its 35% top rate. Replace that with a 23% flat tax, and the bill drops to just under $4.6 million. In other words, he assumes that people won’t change their behavior even though incentives to engage in productive behavior are significantly altered. In a previous post, I showed how rich people dramatically increased the amount of income they were willing to earn and report after Reagan lowered the top tax rate from 70 percent to 28 percent. 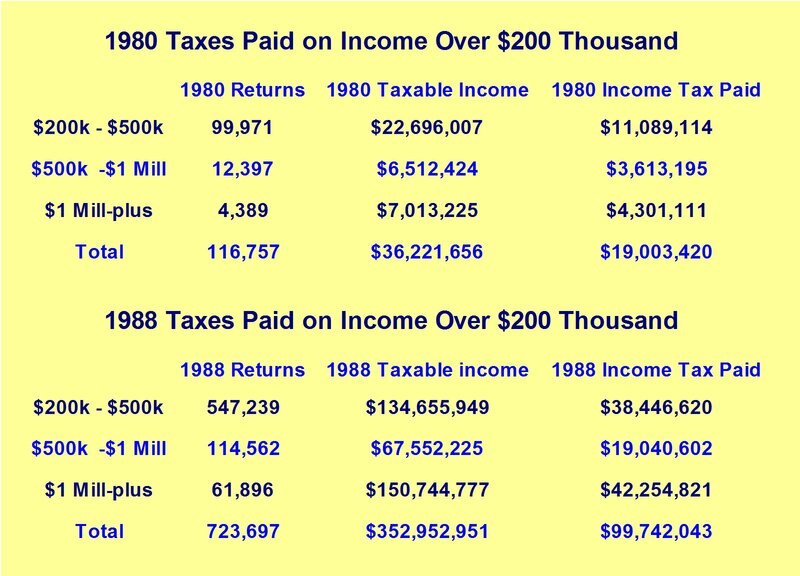 To Blinder, this real-world evidence doesn’t matter – even though the rich paid much more tax to the IRS after Reagan slashed tax rates. For more information, here’s my flat tax video. And here’s the video on the global flat tax revolution. Interestingly, there are now about five more flat tax jurisdictions since this video was made – though Iceland abandoned its flat tax, so there are some steps in the wrong direction. Makes you wonder. If the flat tax is such a bad idea, why are so many nations doing so well using this simple and fair approach? But be careful, as this cartoon demonstrates, simplicity can mean bad things if the wrong people are in charge. This story from ABC News should worry everybody, regardless of whether the people getting trapped in government dependency are white, black, brown, yellow, or green with yellow polka dots. Congress is under pressure to cut the rapidly rising costs of the federal government’s food stamps program at a time when a record number of Americans are relying on it. The House Appropriations Committee today will review the fiscal year 2012 appropriations bill for the Department of Agriculture that includes $71 billion for the agency’s “Supplemental Nutrition Assistance Program.” That’s $2 billion less than what President Obama requested but a 9 percent increase from 2011, which, critics say, is too large given the sizeable budget deficit. A record number of Americans — about 14 percent — now rely on the federal government’s food stamps program and its rapid expansion in recent years has become a politically explosive topic. More than 44.5 million Americans received SNAP benefits in March, an 11 percent increase from one year ago and nearly 61 percent higher than the same time four years ago. Most people focus on the huge burden that the food stamp program imposes on taxpayers, which surely is significant, but there is another economic cost that is equally worrisome, and it applies to all income redistribution programs. Whenever the government gives people money simply because their incomes are below a certain level, that creates a poverty trap. More specifically, because people lose benefits for earning more income, they are penalized with very onerous implicit marginal tax rates for climbing the economic ladder. This isn’t intuitive, so here’s a back-of-the-envelope hypothetical example. Let’s assume you are a low-income person who wants a better life and you have a chance to earn an additional $1,000. How much better off will you be, and will it be worth the costs you might incur (non-pecuniary costs such as the loss of leisure and pecuniary costs such as commuting and child care)? To answer that question, let’s assume your official tax burden on that additional income is 10 percent for federal income tax, 15 percent for payroll tax, and 5 percent for state income tax. You may not even be aware of the employer portion of the payroll tax, so let’s drop that to 7.5 percent (actually 7.65 percent, but let’s keep this simple). And while state taxes are deductible, the vast majority of people with modest incomes don’t utilize itemized deductions. So the marginal tax rate on this additional income, depending on what assumptions you want to make, is between 20 percent and 25 percent. So if you earn an additional $1,000, your disposable income only increases by about $750-$800. Is that worth it? Maybe, but maybe not, depending on the costs you incur to earn that income. In any event, the marginal tax rate is rather steep for a low-income person, you may be thinking. But it gets worse. Let’s say that you lose $15 of government handouts for every $100 of additional income your earn. So when you earn $1,000 of income, you only keep $750-$800, but you also have to give up $150 of goodies from the government – meaning your effective disposable income only rises by $600-$650. This means that your implicit marginal tax rate on earning more money is actually somewhere between 35 percent and 40 percent. In other words, your marginal tax rate is at least as high as the tax rate on rock stars and professional athletes. Here’s a chart showing the number of food stamp recipients. 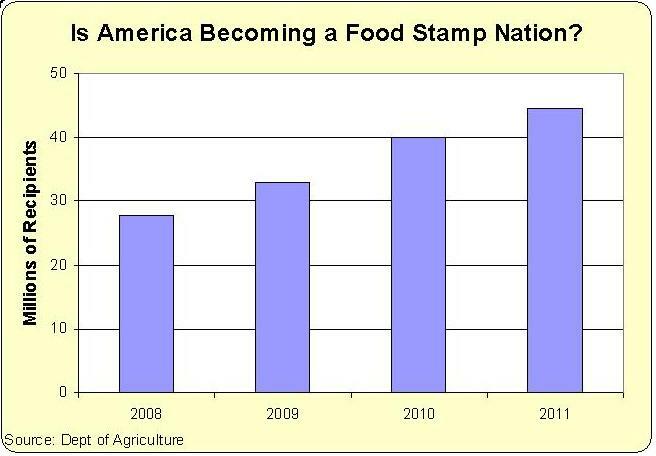 It certainly looks like America is becoming a food stamp nation. But if you want to see an even more disturbing image, look at the second chart in this article from the Mises Institute. You’ll see that my hypothetical example dramatically understates the marginal tax rate on people trying to join the middle class. As a taxpayer, I don’t like the cost of the food stamp program. As an economist, I hate the high marginal tax rates caused by income redistribution programs. I don’t particularly like soccer and I’m not normally a fan of the research of Professor Emannuel Saez, so it is rather surprising that I like Professor Saez’s new research on taxes and soccer. While Saez may have a reputation for doing work that often is used by advocates of class warfare, his latest research is classic, supply-side economics. He and his co-authors studied soccer players and found that they are very sensitive to marginal tax rates. They even confirmed that the Laffer Curve is sometimes so strong that governments can collect more revenue by reducing tax rates on the rich. Krugman won’t be happy about this. Here are some segments from a story about the research in the Christian Science Monitor. …on one subject, Europe’s soccer stars have an important message for Americans: Tax rates. It turns out that highly paid soccer players are sensitive to taxes. They tend to move to those nations that give them a break. Why is Spain’s top league a sudden soccer powerhouse? One reason is tax policy. Why are Denmark and Belgium’s leagues stronger than in other similar countries? Ditto. In perhaps the first study to provide compelling evidence of a link between tax rates and worker migration, three economists look at this highly paid, highly mobile workforce and make several surprising conclusions: 1) Top marginal tax rates matter to big earners. 2) If you’re going to cut taxes to lure such highly skilled workers, make it a big tax cut. Otherwise, it won’t have much effect. …Professor Saez and his colleagues found something striking: The leagues in low-tax nations attracted better players and had better teams. The effect was also pronounced in individual nations that reformed their taxes. For example, Spain in 2004 introduced a new flat rate of 24 percent for foreign soccer players, nearly half the top marginal rate it charged its residents. After that law – called the “Beckham law” because British star David Beckham took advantage of it – Spain saw its share of foreign players increase while the foreign talent in nearby Italy shrank. Tax cuts for foreign players in Denmark and Belgium had similar effects. The Wall Street Journal uses the clash between the Steelers and Packers as an opportunity to make a much-need point about taxes. Because of Pennsylvania’s flat tax, Ben Roethlisberger keeps a greater percentage of his salary than Aaron Rodgers, who gets raped by Wisconsin’s “progressive” tax system. Packers fans shouldn’t worry about this, though, since even I’m not willing to claim that the negative impact of high tax rates on incentives will have any effect on the outcome of the game. We won’t predict the winner of this Sunday’s Super Bowl between the Pittsburgh Steelers and Green Bay Packers. But we can report this much: The Steelers will get to keep a lot more of their season earnings, though both team’s players would be a lot richer if they played all of their home games in Dallas. Take the Packers’ fleet-footed quarterback Aaron Rodgers. He made $8.6 million in 2009, according to USA Today’s database of player salaries. Of that, we calculate he paid roughly $680,000 in state and $3.1 million in federal income and payroll taxes. Steeler quarterback Ben Roethlisberger didn’t earn as much, but he got to keep a relatively larger chunk of his haul—$4.6 million of his $7.7 million salary. (This excludes taxes paid to states that tax players visiting on away games.) Unlike Wisconsin, which has a graduated income tax that charges top earners 7.75% on earnings over $220,000, Pennsylvania has a 3% flat rate. Even football players can behold the merit of a flat tax. Of course, both players would keep a lot more of their earnings if like quarterback Tony Romo (salary: $625,000) they played for the Cowboys since Texas levies no state income tax. On the other hand, Packer and Steeler fans will pay if they travel to Texas for the game since Texas’s beer tax is more than twice as high as their home state’s. I write about the Laffer Curve so often that I’m surprised people don’t run away screaming. But I’ll continue to be a pest because I want people to understand that you can’t just look at changes in tax rates when predicting changes in tax revenue. You also have to consider changes in taxable income. Simply stated, my goal is for people to recognize that higher tax rates lower incentives to earn and report income and lower tax rates increase incentives to earn and report income. However, I also want people to understand that this doesn’t mean “all tax cuts pay for themselves.” That only happens in very rare cases. Moreover, it would be good if people recognized that there are lots of factors that influence the economy’s performance, and it’s therefore important to be cautious when making claims about the relationships between tax rates, taxable income, and tax revenue. So we many not be able to precisely measure the impact of the Laffer Curve, we know it’s there and we know it can be very significant. We also know that economic incentives are not constrained by national borders. The Laffer Curve exists even in nations where politicians generally are not sympathetic to good tax policy. France naturally comes to mind, and here are some excerpts from a new report from Pierre Garello. He examines recent changes in tax rates and the tax base, and finds that better tax policy is having a positive impact. In 2006 a major change was implemented in France regarding the income tax. Not only the top marginal rate was lowered (from 48.09% to 40.00%), but the same treatment was applied to the other rates. Also, the number of brackets was reduced from 7 to 5. As a result, whatever the level of taxable income, the rate applied was lower after the changes took place than before. …the tax base was also enlarged. In particular, while 20% of gross income from salaries was until then automatically deduced to compute the level taxable income, this was no longer the case with income earned in 2006 and after. …Based on data from the French Public Finances General Directorate (DGFiP) we can see that the impact was a minor drop in tax revenues from the 2006 personal income followed by a slightly higher increase in PIT revenues from 2007 earnings. 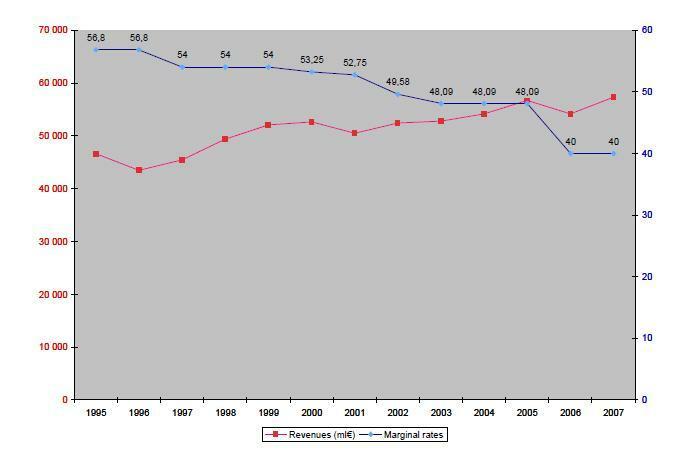 As illustrated by the graph below, the successive cuts in marginal tax rates between 1995 and 2007 have resulted in higher tax revenues.